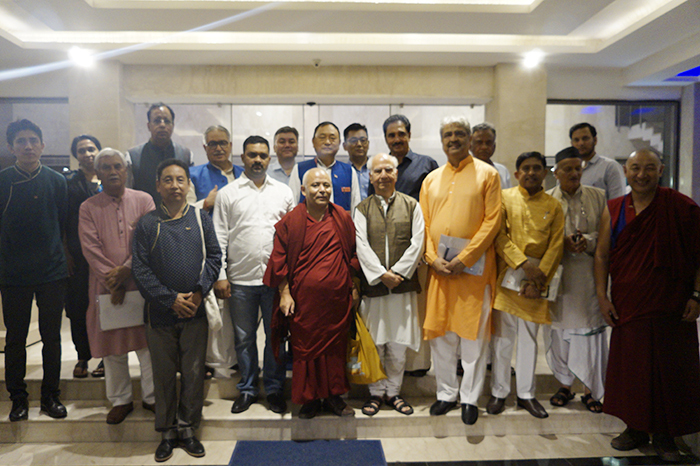 (TibetanReview.net, Aug04, 2018) – A delegation of three members of the Tibetan Parliament in Exile has concluded on Aug 1 a campaign to lobby for support for the Tibet issue, especially for the exile Tibetan administration’s middle way goal, during the ongoing monsoon session of the Indian parliament in New Delhi. During their Tibet advocacy campaign, which began on Jul 23, the delegation, led by Deputy Speaker Acharya Yeshi Phuntsok, met with a total of 58 MPs belonging to Rajya Sabha (Council of States) and Lok Sabha (House of People), the Upper and Lower Chambers respectively of the India parliament. A statement from the Parliament in Exile Aug 3 said the MPs the Tibetan delegation met with belonged to a total of 11 political parties, including from the ruling BJP, the main opposition INC, as well as TDP, CPI, AIADMK, JD(U), TRS, NPF, TMK, LJD, BJD, and Samajwadi Party, besides nominated Rajya Sabha members. They represent constituencies in 22 states. The meetings were stated to include those with six government ministers, including Mr Jagat Prakash Nadda, the Minister of Health and Family Welfare; Dr Jitendra Singh, Minister of State (Independent Charge) for the Development of North Eastern Region, Prime Minister Office, Personnel, Public Grievances and Pensions, Department of Atomic Energy and Department of Space; Mr Satyapal Singh, Minister of State for Human Resource Development responsible for Higher Education; Mr Thawar Chand Gehlot, Minister of Social Justice and Empowerment; Mr Kiren Rijiju, Minister of State for Home Affairs; and Mr Hansraj Gangaram Ahir, also a Minister of State for Home Affairs. Also, a meeting of the All Party Indian Parliamentarians’ Forum for Tibet (APIPFT) was held on Aug 1 at the Constitution Club. Twelve MPs took part in the APIPFT meeting, which was moderated by its Convener Mr Shanta Kumar, former Chief Minister of Himachal Pradesh and a member of the Lok Sabha. The Tibetan Parliament in Exile has been carrying out the advocacy campaign over the past several years, encouraged by suggestions from many Indian MPs to keep meeting and updating them about ongoing developments in Tibet and with regard to the Tibet issue. The other two members of the Tibetan delegation were Geshe Monlam Tharchin and Mr Karma Gelek.